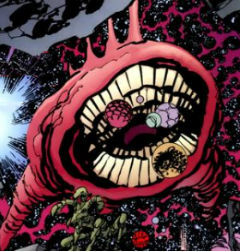 The Awesome Eater is an immense creature that calls Dimension-X, also known as the Void, its home. Dimension-X connects all realities to one another. The Awesome Eater spends its existence making its way through the Void, eating any planets that cross its path. One of these planets was Warworld Thrall, which was once ruled over by Emperor Gorgod. After being exiled to the Void by Mister Glum, She-Dragon found herself on Warworld Thrall where she spent years as a slave to Emperor Gorgod. She eventually gained her freedom by assassinating Emperor Gorgod before running into Angel Murphy . The young girl had just been separated from her companions whose vehicle accidentally crashed into planet Thrall’s shield defenses. With the shield down, the Awesome Eater was able to consume the planet, but not before the heroes were able to escape. The Awesome Eater is later seen when it eats the planet that Mister Glum has stationed his army, killing them all.